Can Sen. Rockefeller lead on global warming? September 9, 2010 by Ken Ward Jr. 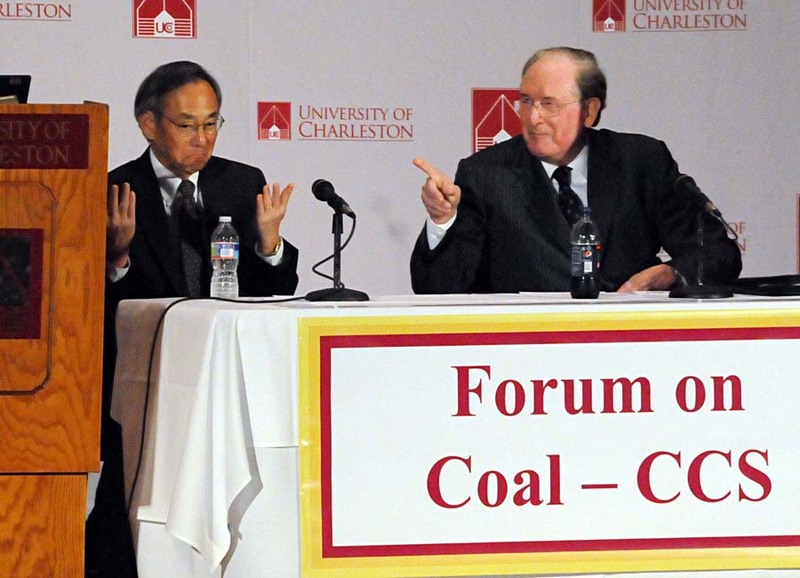 The University of Charleston’s forum on CCS brought a rare bit of calm and reason into West Virginia’s ongoing discussions about the future of our coal industry. Unfortunately, there was hardly any time at all for questions from the audience, and it was too bad that a bunch of folks from the industry front group America’s Power were trolling around in brand-name T-shirts as if it was their event. Don’t fear the Obama administration … we’re trying to help not only West Virginia, but the rest of the country. Who knows if Secretary Chu’s calm, somewhat geeky presentation — complete with PowerPoint, of course — will convince any of the business and industry leaders at yesterday’s event that global warming is real and that if they want coal to survive they better start working harder to make CCS work. Speaking alongside Chu, a Nobel Prize-winning physicist, Rockefeller made perhaps his strongest statements to date in support of the scientific consensus that carbon dioxide emissions are changing the global climate in dangerous ways. Rockfeller, chairman of the Senate Committee on Commerce, Science and Transportation, also blasted industry leaders and members of West Virginia media who promote the notion that global warming isn’t real. The senator said that climate change skeptics are harming West Virginia by putting off efforts to perfect and deploy CCS, giving natural gas more time to cut into coal’s market and hurt mining’s long-term viability. “Burying one’s head in the sand is not a solution, and can only backfire,” Rockefeller said. Rockefeller explained that, while some in industry — and in the Congress — continue to pretend there’s a debate about whether global warming is real, Wall Street is convinced that greenhouse limits are coming, and is withholding funding for new coal-fired power plants until it gets some certainty about what those limits will look like. You talk to most power companies, you talk to most coal companies, they know there is something coming. I agree with the broad scientific consensus on climate change. I care deeply about the Earth. Greenhouse gas emissions are not healthy for our Earth or for her people, and we must take serious action to reduce them. People think they are protecting coal by pretending climate change doesn’t exist. But burying one’s head in the sand is not a solution and can only backfire. Denying the problem of climate change may feel good in the short term, but in the long term, it only locks in an existing infrastructure for other fuels like natural gas and will cost coal miners’ jobs. It’s doable, ladies and gentlemen. It’s doable. That’s called clean coal. That’s something we can live with. This blog has been pretty tough on Sen. Rockefeller … remember the previous posts on this topic here, here and here, just for a few examples. To his credit, Sen. Rockefeller’s comments yesterday were absent the sorts of inaccuracies and blatant booster-ism that Coal Tattoo has tried to call him on in recent months. Several environmentalists who have been very concerned about Sen. Rockefeller’s growing antagonism toward greenhouse gas legislation commented to me last evening about how pleased they were with his remarks at the UC forum. To be clear, I’m not talking about cap-and-trade. That is a debate for another day. Instead, Sen. Rockefeller will continue pushing his own legislation to block for two years any U.S. EPA regulation of greenhouse gas emissions from power plants and his separate bill to pump more money into CCS research and deployment. The lack of comprehensive climate change legislation is the key barrier to CCS deployment. Most of Sen. Rockefeller’s statements yesterday were a big step toward him filling the void on this issue left by the death of Sen. Robert C. Byrd. But we’ve yet to hear much progressive talk from Sen. Rockefeller about mountaintop removal or about the inevitable decline in central Appalachian coal production — and we’re still waiting to see the senator embrace the kind of climate legislation that he must know is needed to really make CCS a reality. I was curious what you were going to have to say about this one Ken. On one hand this forum informed West Virginians repeatedly that climate change is real, that CO2 is up, and that this is a catestrophic problem. On the other hand, it also emphasized that coal is the backbone resource of not just WV, not even just the US, but the entire world. Personally I feel like this forum was a great success!! I am of the opinion that, though I don’t know if anthropogenic CO2 is as bad as it is claimed to be and thus causing climate change, I do believe we should act as if it is true regardless. Senator Rockafeller spoke like a true politician and I can’t fault him for that. However, I was most impressed with secretary Chu’s “pep talk”. “When you are swinging from the heels, you may strike out more, but you definitely hit more home runs. and the United States wants (needs) a home run”. I was ready to start drilling for saline aquifers in my backyard after hearing that!! I wish so bad that the two sides of this endless debate could see this more clearly. WE ARE AMERICA, WE LEAD WE DO NOT FOLLOW!! So let us stop debating the validity of climate change and address it head on. I think one of our greatest problems on the homefront is going to be educating the state. The man at the end of the presentation who sprung up and shouted “WHAT ABOUT REFORRESTATION” was clearly uneducated about this subject. I am happy that Sec Chu threw in the blurb that “we are looking into that too” because it certainly is a component to the solution. However, it is only a very small piece. Our state needs to realize that CCS is truely out to preserve the coal industry. I am not sure if everyone understands that or not. I think a great deal of people (WV and elsewhere) feel that CCS is just more gov’t regulation. And in essance, it is!! But the alternative is the complete opposition to coal. You may not like it, but “thems your choices”. So I truely hope the audiance of the forum yesterday gained a bit of insight regarding what we are up against as a country and more importantly that we still have the ability to be the leader of this innovation. Why is no one asking the obvious question: Carbon capturing and sequestration–where and how? The chief objection to nuclear power is the problem of long-term disposal of radioactive waste. Carbon-capture proposals present the same problems, multiplied thousands-fold. We will mitigate the immediate threat from burning fossil fuels by burying the hazardous byproducts, and let future generations find a way to permanently dispose of them. But with carbon-capture, we are talking about astronomically more waste than with nuclear power. I’m a long-time opponent of the nuclear option, but the current enthusiasm for carbon-capture makes me reconsider. It’s a choice between two nightmares. Again: Why is no one asking about this? So – now we are to play energy favorites as official state and/or federal policy? We are here to “save coal?” Who was it that decided the burgeoning natural gas industry is to be the poor stepchild? Gas is in virtually all ways preferable to coal. Honestly, I hope CCS never happens. Yes, CO2 is super bad, but it’s not the only emission from burning coal. All visions of CCS show increased NOx and SO2 emissions, which are among the leading cause of the explosion of asthma cases, and acid rain, respectively- not to mention the 30% reduction in efficiency of CCS plants v non-CCS, which means more AMD, more mountaintops removed, more coal ash, and less time on the coal clock (which, by the way is about 86 years, if you factor in any kind of increase in electricity usage). Do we really want to put all that money and effort into 60 years worth of electricity? We’re talking about today’s miners actually seeing the end of coal in America. Does this finally scare you into thinking maybe we need more options? By the way, my info comes from the US Energy Information Administration (remaining coal), and various scientific and engineering journals (CCS). It’s all solid and verifiable. You make some valid points … please if you’re citing specific EIA or scientific articles, provide citations and links to education other readers. but I”m unclear — are you arguing that coal burning’s critieria pollutants (NOx, SOx, etc) are a bigger concern than CO2? What Jim Sconyers says is a legitimate position. It would also be helpful to really address why so many sincere and concerned people like Chu think that CCS is necessary on a GLOBAL level. India and China are not home to lots of natural gas — and the pressure on those countries to use lots of coal is, in many smart peoples’ minds, irresistible. If this is the case, then only CCS offers hope of reining in the ongoing deadly increase in atmospheric CO2 concentrations. Here in WV, as Senator Rockefeller realizes, having the goal of “saving coal” is politically a necessity. From a planetary perspective, “saving coal” with CCS may well be necessary for human survival. The development and implementation of CCS (if it proves economical, which it may, if there is a growing price on carbon emissions) is indeed going to help preserve markets for West Virginia coal, including surface mined coal. To me, it seems quite possible that saving human civilization may well require “saving coal” in one fashion or another. The market will make that final determination one way or another, once we get a price on carbon emissions, or have “rules of the road” as Senator Rockefeller put it. For now, I can’t see how we can avoid giving it a try — the stakes are that high. As a West Virginian who has been intellectually engaged on these issues for several years, I thought Senator Rockefeller was acting in the recent Robert Byrd tradition — of facing difficult truths. I was very proud of his presentation. And kudos to AEP and Charles McElwee for getting this program to happen! CCS is an enormous waste of money. I read the Task Force report (http://fossil.energy.gov/programs/sequestration/ccstf/CCSTaskForceReport2010.pdf), it’s never really addresses the problem that it’s NEVER BEEN DONE on a commercial scale. Current pipelines can transport 50 million tons of CO2… but our coal-fired power plants create 1.7 BILLION tons! That is a LOT of pipeline to be built, who’s going to want it running through their community. And most importantly, the report itself (on page 28) says that CCS will “significantly increase” the cost of electricity by 40-80%!! Uh, no thanks. baryshnikov81, you are right, the US should lead, not follow. But why not lead in the true technology of the future – renewable energy? China, Germany, Spain, Denmark… all these countries are beating the pants off us when it comes to wind and solar technology. This report shows that we can save billions by transitioning off coal by 2050 using today’s technology: http://www.synapse-energy.com/Downloads/SynapseReport.2010-05.CSI.Beyond-Business-as-Usual.10-002.pdf. Why aren’t we doing this? T.Rod, great analysis and the natgas comments are right on. Plus natgas prices historically have swung wildly and I would expect those fluctuations to center around a much higher level if its electrical component went to say 40 or 50%. The dense shale plays have a lot of room to grow but the wells tend to decline rather abruptly. B.Canary, why not go done both paths of renewables and CCS (if you can afford it or maybe we can’t afford not to)? Technologies of both are in the earlier stages of development and who can predict future technologies and their costs? From what I’ve read Spain is not a economic successful renewable model. While the TF report does include some pretty strong statements about the scale problem for CCS (For example, Technologies exist for all three components of CCS, but they have not yet been deployed at the scale necessary to help achieve GHG reduction targets, on page 27), it does not contain the sorts of numbers you mention, which add an important perspective. @ Blue Canary – I whole-heartedly agree with renewables, however the idea that we are going to power even half of the US electric grid with wind\solar\hydro is ludacris! (coal powers 52% of the US). I am not advocating for coal because I like the way it looks or smells, I am just saying that besides the elephant in the room that no one wants to talk about (nuclear), there is no sustainable fuel that can offset such a great demand. So if we are stuck with coal, and CO2 is in fact destroying the atmosphere, then why not lead the way in trying to mitigate this problem? oal no longer provides “more than 50 percent” of our nation’s electricity. It hasn’t since 2004, according to this data from the U.S. Department of Energy’s Energy Information Administration. In 2009, American power companies generated less of their electricity from coal than they have at any other time in recent memory. There might not be enough coal to make CCS a sound investment, even if CCS could be developed in an economical way according to this article in National Geographic, that states we will likely reach peak coal production in 2011. But I doubt if anyone cares, just like they don’t seem to care about 20 million people left homeless in Pakistan due to the recent floods, that, (are you ready? ), was likely the result of climate change. Certainly a few thousand strip mine jobs are more important than that. Ok, fine….44.6%. Assuming the US power grid demands approximately 330GW of power, to offset coal’s role in the equation we need to come up with 147,000MW of renewable power. There is no real need to go into how many windmills or solar panels that would take. the 52% number was not my point. My point was the fact that everyone seems to think that renewables (in any combination) are going to be our saving grace and its just simply not the case. I am a firm supporter of all renewable generation, but Im not naive enough to believe that we are going to come close to offseting coals hand in this mix. Again, bottom line to all of this is, like it or not we are kind of stuck with coal for a while. you can fight it, or you can get behind the only known technology that has been proven to mitigate CO2 pollution thus far, for me I choose the latter. The important point is not so much what the exact percentage is, but that the trend is for coal’s share to continue to drop … that is an important factor to consider in all of this. Also, I’m not sure it’s fair to describe CCS as having been “proven” to mitigate CO2 pollution, considering all of the questions about transferring it to the scale needed to make a difference. Smarter people than me have outlined all of the hurdles for CCS, but they — like you — believe it is part of the mix. I just believe, as Tom Rodd has said, in going into this with our eyes wide open. Maybe coal’s share of electrical generation in the U.S. has been decreasing but that does not mean if natgas goes above $5 and the economy recovers that coal won’t return to 50%. Also it looks like China and India will be importing substantial sums in the future. Like many have said, coal is here to stay for a while out of pure economic necessity. I think this argument is for nothing in the economic enviroment we find the world and the US in at this moment. The winds of change are blowing in washington and no one in congress, no matter what they say, is going to inpose a tax on carbon in this enviroment. Republicans are certainly not going to propose one and the democrats are running for their lives. With projections of a split house and senate in november in my opinion ca and tax is dead. Right or wrong the american people are not going to support a bill that could possibly raise their energy bills. Scott14, as always you have good political instincts. But perhaps you are missing one thing. The richest and most powerful (and amoral) forces in the world understand that only putting a price on atmospheric carbon emissions will make THEIR (and their money’s) survival possible. The “american people” can “take a ****” when they come up against the gnomes of zurich, or whoever your favorite financial cabal are. The folks in command see the iceberg, thanks to modern science. The ocean liner is turning. But is there time to miss the collision? Stay tuned — and enjoy the ride! Wow, great discussion. Mr. Rodd raises the globabl perspective and it is dead on. But to add to that, CCS is not just a coal solution, it is a fossil fuel solution–for gas and oil as well. There are a lot of potential answers to climate and it is not just coal with CCS. While “proving up” CCS for coal and natural gas, there are steps that can put us on the path of emission reductions: efficiency gains that can reduce emissions with higher efficiency coal plants (supercritical plants that are20-35% more efficient), more efficient natural gas plants and industrial processes and of course nuclear. More electricifaction helps–think about where emissions would be today if we were still burning as much oil, coal and gas at the end use rather than using technologies that use electricity. Looking ahead on this point, the Electric Power Research Institute concluded that increased electrification of the transportation sector throurgh plug in hybrids would reduce emissions by more than 30% even using the current mix of electricity generation. Skeptics of CCS should be skeptics of wind or solar being answers as well I suppose since it also faces scaling and affordability challenges. In the US, wind still provides only 1% of electricity. The International Energy Agency sees the intermittency and scaling-up challenges as limiting renewables to only 5% of global energy consumption in 2030. Think about this: if wind’s intermittency limits its availability to around 10% as the regional operator in Texas has concluded, you will need to build 90% backup from traditional baseload sources like coal, gas and nuclear. That is quite a bit of redundancy. The National Renewable Energy Lab found that it would cost over a trillion dollars to reach a 20% renewable standard in the Eastern US, and that did not even include the back up power capacity needed. The CO2 reductions were somewhere around 6% or so. Natural gas is key, but some see its production barely keeping up with declines expected in imports from Canada. Does natural gas really result in 50% less greenhouse gas emissions than coal? One professor from Cornell suggests not–and that it may be equivalent when accounting for methane emissions from production, transportation, processing and use. http://www.technologyreview.com/blog/energy/files/39646/GHG.emissions.from.Marcellus.Shale.April12010%20draft.pdf. This is an area that probably deserves more research, but looking at EIA data natural gas is the source of 60 % of all energy related methane emissions as compared to coal that accounts for 28%. There are indeed hurdles and problems with all energy sources. I’m equally wary of analysis from those who argue that coal must remain a major part of the picture forever as I am from those who argue that coal must go away tomorrow … I doubt either is correct, and the answer is more complex than that. Climate change needs not a silver bullet, but a shotgun approach — all energy sources and possible emissions reductions plans on deck. In fact, when asked by the media why the administration wasn’t pushing for a climate bill this year, Secretary Chu cited the economic environment, and said there just wasn’t a chance to pass such a bill until the economy shows more signs of improving. But, Secretary Chu also explained that the costs of things like dealing with greenhouse gas pollution always end up being far, far less than industry and the government expect — and it’s also important to factor in the true costs of energy production to this picture. There is every reason to believe these things are true in this instance …. The EPA concluded that the APA would be affordable for American families if it is enacted. The average family will have to spend less on energy if this important legislation passes, primarily because of increases in energy efficiency mandated and stimulated by the legislation. EPA projects that passing the APA would reduce Americans’ annual energy expenditures by 10 percent by 2020. And of course, while coal-fired power appears cheap, that’s only because the true costs are seldom counted, as Coal Tattoo has written over and over. am I getting this right? ccs will require a large amount of piplines and infrastructure built so that it could be 10-20 years before its really a solution and at the same time we are to push underground an amount of gas equal to the world’s output each year of oil? I want to echo Ken’s comment suggesting that there is a general expert consensus that the only effective way to get atmospheric carbon pollution emissions under control is to implement a broad suite of emissions-reducing energy strategies — including more nuclear, more natural gas, more efficiency, CCS coal, more baseload solar, biofuels, wind, etc. Climate policy experts call these strategies “wedges” — because they can (cumulatively) reduce the ongoing rise of, and eventually flatten, the atmospheric CO2 growth curve — a curve that, as Sec Chu’s power point showed, will (if unchecked) blow humanity to God-knows-where. That mechanism is to put a gradually increasing price on atmospheric carbon pollution — and then, as Chu and Rockefeller said, the market and the innovators will compete in and among the strategic wedge areas. Because the big money people of the planet “get” this analysis — and because they have expressed their views to people like Senator Rockefeller, so he “gets it,” too — this change is coming, as the Senator made clear. In my unsophisticated and no doubt overly dramatic view, perhaps what we just saw at the University of Charleston was “the word” coming down from on high, in a public fashion, to the leadership of West Virginia. It may have been for that reason an important historical moment. The curse of living in interesting times . . ..
You know, it’s nice to see a comments section with thoughtful, reasoned comments instead of the knuckle-dragging name-calling that I usually see. Anyway, I’m not sure we can afford to invest in both CCS and renewables. I’d rather my tax dollars went to supporting research, development and deployment of actual renewable technology which is ready now – and energy efficiency, which will make renewables that much more viable a solution – than towards CCS which is unproven and unlikely to be viable for another decade. If the coal companies and utilities want to put their money into cleaning up their own mess, then great. But the US government already subsidizes fossil fuels to the tune of around $10 billion a year, so I think they get enough of our money already. @ blue Canary – we don’t see eye-to-eye on the impact that renewables can have, but thats a different debate for a different time. However you make a good point about funding. Which is why I feel that we should model current carbon legislation to mirror the SO2 program of the 1990s. I think many folks don’t realize that the Acid Rain program was……brace yourself…..CAP AND TRADE! and guess what it was a success!! for multiple reasons that I wont delve into. However the primary component that I feel should be implemented in current legislation is the fact that the revenues from the SO2 auctions went back to the emitters by means of funding for flue gas scrubbers and low NOX burners. If we could just do the same with revenues from CO2 emissions to help employ CCS technologies, I feel like this whole issue would be much less burndensome to those who remain skeptical.